Dimensions: 9 1/2" x 7 3/8"
This group of eight riders posed before the distant hills is a classic Degas painting, merging the gentle colors and sense of illusion that characterize the artists later works. Degas spent a lifetime studying motion, and the strong flanks, graceful muscles and dramatic energy of the horse and rider made equestrian scenes among his most beloved themes. Degas continued to grow artistically throughout his lifetime, despite the gradual deterioration of his eyesight. After 1880, pastels and sculptures provided unique ways for Degas to explore his favorite motifs. 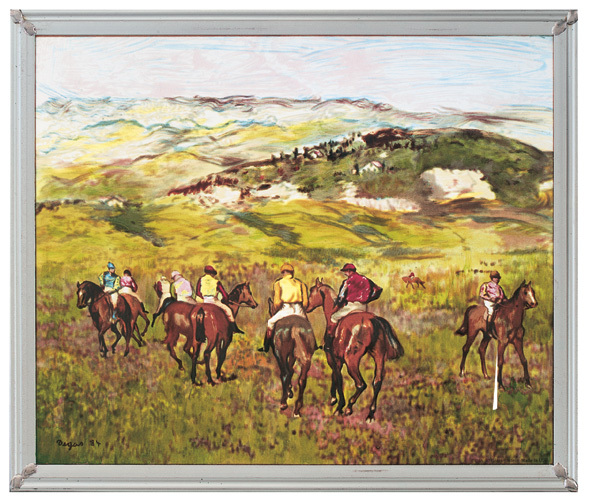 Color, design and background all work together in Jockeys on Horseback before Distant Hills to provide a powerful sense of space and depth with a dynamic intensity between the rider and his mount.